A link to a description of the Thumper air circuit has been added under the Power Hammers Link. Hi.... 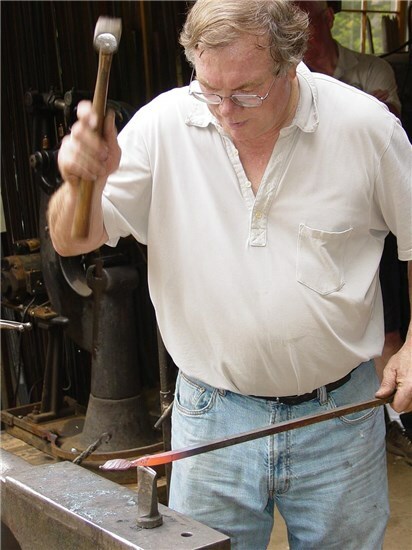 I'm Dave Hammer, a hobby blacksmith. Welcome to Hammer Fire Forge. A place to sit back, relax, learn and enjoy the adventures of our blacksmith community. This website was primarily created to provide a place to hold information about the Cricket, a small utility air hammer I designed in the spring of 2017. The website also includes links to numerous YouTube videos I've made before and after the development of the Cricket. All information provided on this website is copyright protected. When you hover the cursor over one of the links on the Home page (Top Menu Line), it will display (in a pull-down menu) the sub-pages for that topic. You should first click on the main menu link to see information associated with the primary link. Home.... This is the home page for the website. When you are on other pages, you can return to the home page by clicking on this link. About.... This provides a short bio about me. Power Hammers... The menu pulled down when you hover over this link will provide links to power hammers I have designed and built. Cricket... This link will take you to documentation for the first air hammer I designed. It's called The Cricket. It has an unconventional design with the core of it being similar to a hammer that was first sold commercially during the 1990s (the air cylinder driving the ram is mounted below the ram). I added physical and functional features that make it unique among homebuilt hammers made today. Most of the information on this website is dedicated to that hammer (it's the reason the website was created). I decided to freely share the design with others and wrote extensive documentation (on this website) for it. I also produced 13 videos which show how it was built and is operated. All those videos are on YouTube and accessible through this website as you read through the Cricket information. To learn about the Cricket, click on "Cricket" for introduction information, or hover your mouse over the link "Cricket" above and then click on entries in the index as you wish.... If you read all the way through, you will understand it throughly. Links to the demonstration and build videos are imbedded in the text. Mini-Cricket... This the smallest Cricket I have made... Just a fun project. Jimminy... This is a Cricket half the size of the original. I built it so I could more easily take a power hammer to a meeting or conference. The hammer weighs only 160 pounds and I can easily put it in the back seat of my pickup. Videos.... I have produced over 40 videos for YouTube.... Some are in support of the air hammers, but the majority are instructional videos, teaching blacksmiths how to make small projects. Click on Videos to see a list.... Then click on the video you wish to watch. When it's finished running, close the video window by clicking on the rightmost "X" on the line at the top of the display. The air hammer build videos are not included in this list... Links to them are found on the Cricket and future Thumper pages. Forum.... When I first built this website, I was hoping that a lot of the discussion about the hammers would be concentrated on the forums I set up here. As it turned out, most of the discussion is on the Facebook group pages... The forums remain here for future use, as the community desires. These pictures illustrate some of the work I have done since 2003. Are you wondering what type of equipment I have in my shop? Clicking on a picture will provide a closer look. Contact.... I disabled this because I was not seeing messages quickly.